Before an ambulance blocked pit road in Saturday’s NASCAR race and stacked up unsuspecting cars, there wasn’t much outside attention on medical transport at tracks. But following Saturday’s incident several drivers say there’s been a number of issues this year—including, bizarrely, ambulances getting lost on the way to infield medical centers. The ambulance from Saturday at Richmond Raceway, which eventually brought up the wider discussion, nearly cost Monster Energy NASCAR Cup Series driver Matt Kenseth a spot in the newly named “playoffs.” With the field coming down pit road under caution and not expecting a vehicle to be blocking it, drivers got bottled up and contact busted Kenseth’s radiator. The damage ended Kenseth’s race, leaving him to watch and see if he got knocked out of a playoff spot. 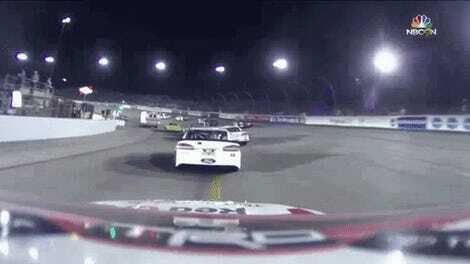 NASCAR later confirmed that the ambulance driver didn’t listen to directions over the radio, and that officials probably should have closed pit road to prevent things from going the way they did. At least Kenseth’s ambulance issues didn’t severely impact the playoff grid, or else we could have seen a repeat of the “playoffs” grid in 2013. You don’t want to see a repeat of 2013. But NASCAR’s ambulance issues didn’t end when the playoff grid played out favorably, since ESPN reports that drivers like Kevin Harvick and, of course, Kenseth had more to say about their (not great) performance all season. “Everybody is doing a great job when they get to the cars, but we still have some issues of getting the ambulances and things from several drivers to the infield care center without getting lost,” Harvick said Wednesday during the NASCAR playoffs media day. 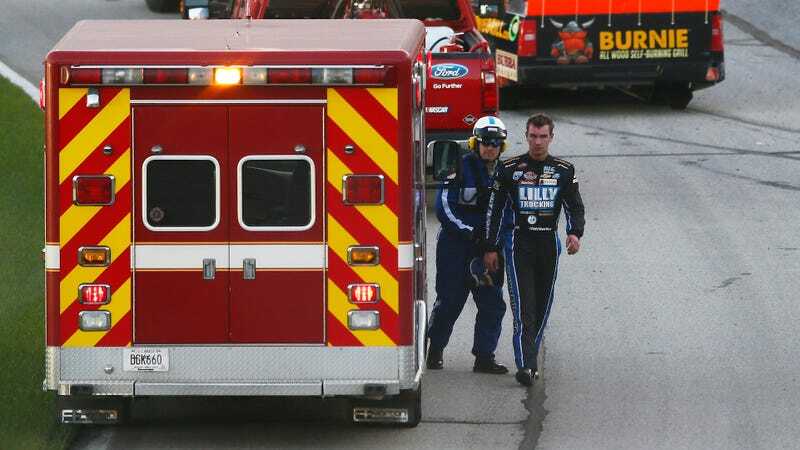 NASCAR drivers are required to go to the care center when a car can’t drive under its own power after a wreck, so most of the time, an ambulance getting lost is just an inconvenience to an unhurt driver following protocol. Harvick added that he knows NASCAR is “continuously working” to improve response times to hard impacts in case someone is hurt, which is the most important thing, but that “the ambulances need to know where they’re going” afterward. “At the spring Richmond race, I was driving around the infield for about five minutes with him and he was lost and couldn’t find the care center,” Kenseth said. “So thankfully, I wasn’t bleeding to death. It is completely absurd to think about getting in an ambulance, unhurt, only to leave with a headache because you banged your head as a result of the driving. “The follow-up discussions that centered around the ambulance issue at Richmond went well beyond where it parked and the procedure that led us to that point,” NASCAR said in a statement. “It was all-encompassing, and we’ll continue to work with the tracks and safety teams to improve in every aspect of support. ESPN reports that Harvick said he feels like NASCAR is taking the issue seriously, and that NASCAR acknowledged it was trying to fix things. Fellow Cup Series driver Brad Keselowski didn’t have much concern about the ambulances, saying he thinks the important thing is to “just make the [race] car right” so you don’t have to worry about that. Uh, that’s one way to look at it?